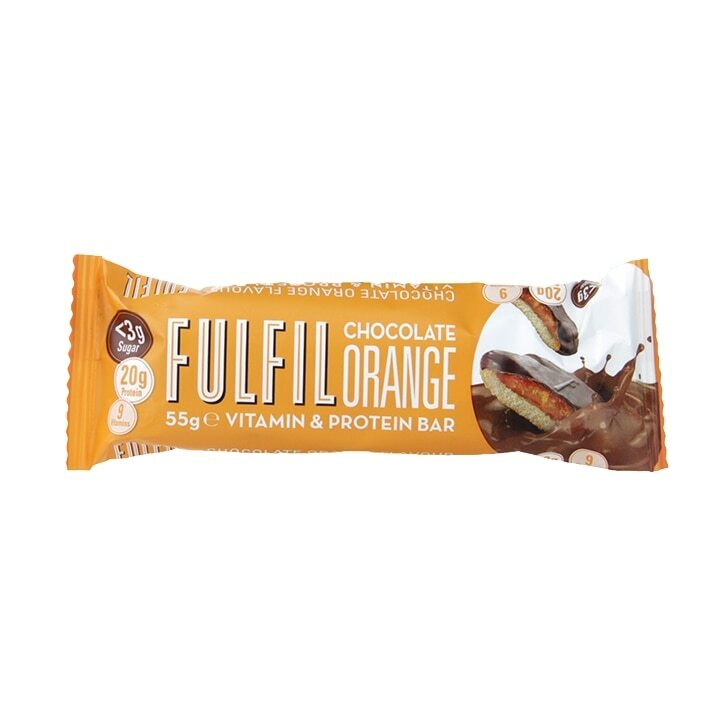 After months of experimenting and taste testing the Fulfil team were finally satisfied, since then they’ve expanded the range and now offer a total of 8 mouth-watering protein bars. Milk chocolate (28%) (sweetener: maltitol, cocoa butter, milk powder, cocoa mass, emulsifier (soy lecithin), flavour), milk protein, humectant: glycerine, collagen hydrolysate, water, soy nuggets (soy protein isolate, cocoa, tapioca starch), palm fat, orange juice powder (3%) (maltodextrin, orange juice concentrate, acidity regulator: citric acid), candied orange peel (2%) (orange peel, glucose fructose syrup, sugar, acidity regulator: citric acid), vitamins (vitamin C (ascorbic acid), niacin, vitamin E (tocopheryl acetate), pantothenic acid, vitamin B2 (riboflavin), vitamin B6 (pyridoxine hydrochloride), vitamin B1 (thiamin hydrochloride), folic acid, vitamin B12 (cyanocobalamin), acidifier: citric acid, flavour, colour: beta carotene, sweetener: sucralose. Fulfil Chocolate Orange is rated 4.4 out of 5 by 7. Rated 4 out of 5 by Berry2 from Tastes fine Tastes quite nice. No artificial taste as many bars. Crunchy bits add a good texture to usual bars. Cost rather high though. Rated 5 out of 5 by Boopie from Couldn't have grabbed this sooner! Saw this in store today and new I had to try it! I really love chocolate orange and this really hits the spot for me. It's nice and soft which some crunchy pieces on top. Perfect substitute for more unhealthy chocolate bars, especially considering it's low sugar content! Treat yourself and give this a try! !